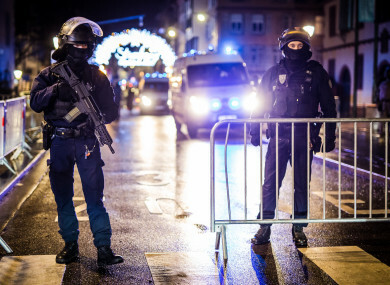 HUNDREDS OF SECURITY forces have been deployed in the hunt for a lone gunman who killed at least three people and wounded 13 others at the famed Christmas market in Strasbourg, with the French government raising the security alert level and reinforcing border controls. Police union officials identified the suspected assailant as Cherif Chekatt, a 29-year-old with a thick police record for crimes including armed robbery. The two officials spoke on condition of anonymity because they weren’t authorised to publicly discuss details of the large and ongoing investigation. “The attacker, who was on the S list (of extremists watched by police), is actively being hunted by security forces,” local officials earlier said in a statement. The attack took place at around 8pm (7pm) yesterday on one of the busiest streets of Strasbourg, sending crowds of shoppers fleeing for safety. Senior Interior Ministry official Laurent Nunez said the man had been radicalised in prison and had been monitored by French intelligence services since his release from jail in late 2015, because of his suspected religious extremism. Nunez, secretary of state for the Interior Ministry, said on France-Inter radio that police sought to arrest the man on yesterday morning, hours before the shooting, in relation to an attempted murder. He was not at home but five other people were detained, authorities said. He said he had seen three people injured on the ground only a few metres from the giant Christmas tree in the centre of the city. Several areas neighbouring the Christmas market were sealed off on last night and residents were being told to stay indoors. Three years after groups of jihadists gunned down and blew up 130 people in Paris on 13 November 2015, French counter-terror officials say their focus has shifted. Rather than coordinated attacks, their main concern is attacks by “lone wolves” – self-radicalised individuals acting without links to terror groups such as Islamic State. Email “Strasbourg attack: Gunman who killed three people at Christmas market identified”. Feedback on “Strasbourg attack: Gunman who killed three people at Christmas market identified”.